This is still a work in progress and if you got tips or comments, let me know. I will update this blog post as I am further in my setup. One of the downsides of using a Raspberry pi as a NAS solution is a somewhat low speed in transferring data. This is partially caused by the fact that in my previous NAS setup I'm using external USB HD's. I came across some the cubieboard and what jumped out to me in the specs is that it has a SATA connector on the board, so I immediately wanted to give it a try. Through ebay I bought a 'Cubieboard A10 ARM Development board luxurious package'. This kit contained a cubieboard one (developer edition), an enclosure, a 3.5" HDD addon board, a TTL to Serial cable, a breadboard with VGA connector, a uSD breakout PCB and a heatsink. 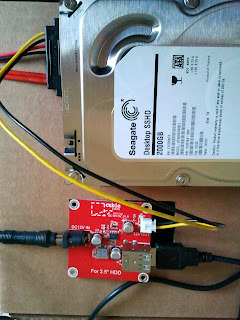 I was especially interested in the 3.5" HDD addon board as I am planning to combine the cubieboard with a Seagate 2TB SSHD. To make this whole setup work I had to buy a microSD card to host the OS and an external power adapter (Ansmann APS 1500 traveller) to supply adequate power to the cubieboard and the HD. The microSD card came with an adapter card that could easily be plugged into my computer. I downloaded/unpacked the Cubian image and write it to the microSD card. I first went for the Lubuntu image, but that starts a XWindows by default, which is too much overhead for what will essentially be a headless node. Turning off the XWindows environment would be too much work so I decided to go for the Cubian image, which is a debian derivative. As the raspberry pi NAS also uses a debain flavoured distro, I think this might be the safest path to take. but that didn't help changing my keymap. If this does not automatically starts the interface for setting your keymap, execute the following. The default user is 'cubie' with password 'cubie'. So that definitely needed to change to start securing the cubieboard. I added my own user to the system for 'day-to-day' access. This same user is used on several of my systems. ssh-copy-id-i ~/.ssh/id_rsa.pub "<user>@<ip address of cubieboard> -p 36000"
Other security related configurations following o.a. this blog or this blog (last one is more specific to raspberry pi, but most things can be applied to the cubieboard). I had some trouble accessing my samba share but this is the current entry in smb.conf that works for me. After installing the ciffs-utils and running sudo mount -a, I had access to the raspberry pi's data. First test I did was copy an 734MB iso file from my notebook to both the raspberry pi nas and the cubienas. What?! It took approx as much time to copy it to the raspberry pi NAS setup as it did to copy it to the cubieboard. The only explanation I have for this is that I'm connecting to these NAS setups via powerlan. And that might just be too slow to make a difference when transferring data. Newer and (hopefully) better performing powerLAN devices. Setup a wireless router connected to the switch next to the NAS setups. and a progress bar showing the fsck progress. So several cold reboots caused some errors on de file system. So I guess I will need to be patient until the fsck is finished. 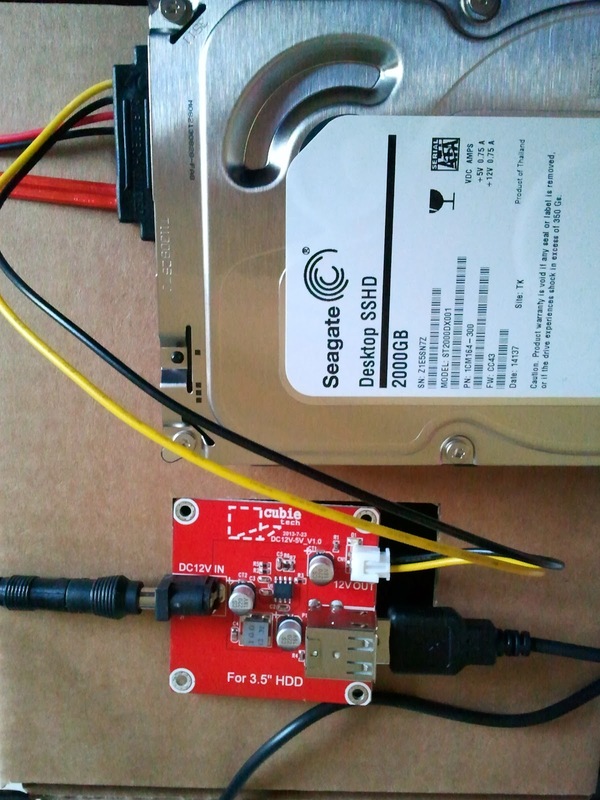 I continued to check the hard drive using the SMART disk monitoring tools, following this article. These tests did not turn up any hard drive problems, so basically cold rebooting the cubieboad NAS caused the file system errors. I haven't looked at setting up SMART as a daemon, but I'll investigate it in the future to have this setup on all my machines. The next test I performed was to start syncing again between my raspberry pi NAS and the cubieboad NAS and redirecting all output to log files on the SATA drive. If something was going to happen during sync I hoped the log files might contain some clues after I reboot the system. But actually, after a lot of big syncs the cubieboard was still up and running. So I guess the system freezes were caused by any output of the syncing not being redirected to output files. Nice project, I was thinking of doing the same. Benchmarks would be great as I'm wondering how much data it can push through it's Gbe NIC. Thanks for the feedback. I'm currently juggling a few projects around and I'm looking for some time to work and improve on this project. By the way, how about trying to run OMV (Open Media Vault) instead of manually setting up everything? I'm running it on a pimped out thin client (2Ghz AMD CPU / 2 GB RAM / 60 GB OS HDD / 1TB USB HDD / Gbe NIC). It's not the best setup but it actually runs pretty good, about 40 to 50 MB/s (Megabyte!) using CIFS and it's rock solid. Have a look, you'l like it for sure. It's free and can be installed on Debian. I hate to break it to you, but the Cubieboard V1 (the one based on the A10) will never outperform your Raspberry Pi solution when it comes to raw transmission speed, simply because both suffer from the slow 10/100 Ethernet port. Should've bought the Cubieboard 2 or the Cubietruck with the A20 and GBit LAN (actually 480MBit/s due to bus limitations). My main problem is that the powerLAN connecting my downstairs laptop that needs to push backups to these home brewn NAS solutions is way too slow to be usable. So in my view, to make it usable I either am going to add a wifi dongles which in my case have faster transfer rates (although security might become a headache) or I have to look into some home remodeling to put some UTP cables in place.